The Continuum continues a series of roundtable interviews with the Smallville cast and producers from Comic-Con International last weekend with Erica Durance, who returns in Season 9 as Lois Lane. Durance talks about her relationship with Clark and Oliver, the complexities of Lois and appearing in the bulk of the episodes. IRON MAN 2 -- ROBERT DOWNEY JR. The Continuum continues a series of post-panel interviews from Comic-Con International in San Diego last weekend with the cast of Iron Man 2 with Robert Downey Jr., who returns as Tony Stark/Iron Man. Downey talks about putting the story together, Tony's relationship with other characters and filming on a "ginormous" set. BOOM! Studios has released its solicitiations for October. Devil's Due Publishing has released its solicitiations for October. Zenescope Entertainment has released its solicitiations for October. 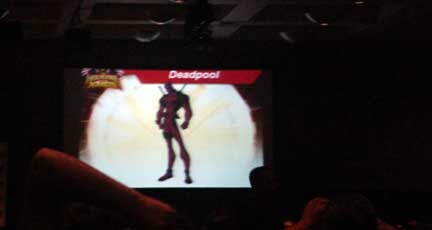 Deadpool will be appearing in the second season of Wolverine and the X-Men, it was announced last weekend at Marvel Animation's panel at Comic-Con International. Deadpool will be voiced by Nolan North, who voiced the character in the Hulk vs. movie. North also voices Cyclops in Wolverine and the X-Men. Marvel also announced that Havok and Magik will be in the second season, with a larger role for Colossus. Images shown from the remainder of Season 1 on Nicktoons included an image of the early X-Men from an episode called "Breakdown," the 20th of the season. "It shows a little bit of Cylcops' past and how he brought into the X-Men," said story editor Greg Johnson. "It's one of my favorite episodes." Other images included a Mojo-possessed Wolverine from "Hunting Grounds," the 15th episode; a Sentinel from "Badlands," the 15th episode; and Archangel from "Guardian Angel," the 19th episode. Click on the thumbnails for larger images and look for more on Wolverine and the X-Men soon here in The Continuum. 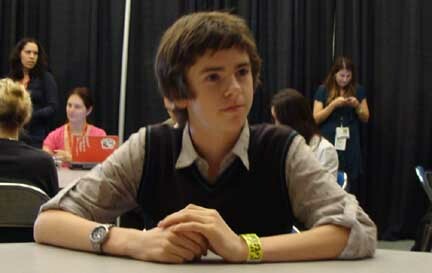 The Continuum continues its coverage of the upcoming Astro Boy movie with an interview with Freddie Highmore, the voice of Astro Boy, from Comic-Con International last weekend. In other Astro Boy news, six new images were released on Tuesday. Look for more Astro Boy news soon here in The Continuum.